The Garmin Edge 820 puts a color touchscreen and advanced mapping functions into the same size unit as the Edge 520, but it is much more powerful. With the Edge 820, the pre-installed Garmin Cycle Map provides turn-by-turn cycling-specific navigation, address search, points-of-interest, audio prompts, and even a round-trip Course Creator that will design a custom local route based on rider preferences for length and difficulty. ANT+, WiFi, and Bluetooth connectivity allows for compatibility with power meters and Garmin Varia™ devices, along with allowing text, call, and other notifications from a paired smartphone. It also makes possible Garmin's GroupTracking feature that allows other Edge 820 users to join together to show real time positions, useful for keeping track of riders when they get split up, or for locating the exact position of a group ride when meeting up. Advanced performance metrics include VO2 max, recovery advisor, FTP, performance condition, stress score, and other cycling dynamics when used with a heart rate strap, and power metrics include left-right power balance and power phase for determining evenness of pedalling. Strava Live Segments allows real-time KOM tracking with premium accounts, and while paired to a smartphone, built-in incident detection can send a message to an emergency contact in case of an accident. All this data is easy to see on the 2.3" high-resolution color touch screen. Its ambient light sensor automatically adjusts for the best visibility in all conditions, and the touch functions are designed to work even when wet or when the user is wearing gloves. When power is running low, a battery-save mode shuts off the display while still recording GPS location and providing notifications, extending the remaining battery life by up to 50%. 2.3" display. Unit measures 1.9" x 2.9" x 0.8". Claimed weight is 2.4 oz. 15 hour battery life in GPS training mode. Rated IPX7 waterproof. 16 GB internal memory. Includes standard and out-front handlebar mounts, USB charging cable, tether, and user manuals. Once set up properly, which took a bit of studying, the unit works fine. I like how easily the head unit is Integrated with the sensors. The software is so so in the user interface department, which is SLOW, for 2019, standard. This is really annoying, and distracting, when you are riding. My biggest complaint has to do with the screen. It is basically as good as my Palm Pilot from about 2004! The color and resolution on the screen are not acceptable in todays standards. Garmin, for charging $400, you can do better than that. The few times I was caught in the rain when I was riding the screen when crazy! The rain drops randomly changing my screens and settings. I guess I could have changed the touch sensitivity then but I was too busy to not cause a crash in the pace line. My 820 is out of warranty now so I will be replacing it with one of their competitors when it dies. I have been using my Garmin Edge 820 for about six weeks, including a trip in the Canadian Rockies. I have found the Edge 820 to be very accurate in the data that it provides (speed, distance, heart rate, elapse time, course, altitude), and very reliable. The battery life is better than my Edge 800. I do not usually answer my phone or respond to messages while I am riding, but the blue tooth connection to my smart phone is very convenient in telling me who is messaging or calling me, thus allowing me to answer or respond if I need to. I may have reviewed this already but I don't see it and now I have been using it for about a month. I agree with people that say the touch screen is not something for Garmin to be proud of. It can take several taps to get it to respond. It, therefore, is not up to date in this technology. That said, it otherwise works extremely well. I am not sure it is worth the upgrade to a so-so touchpad from the button 520 model, but it is very good. The one thing to note is that the beeper (if you are using a Garmin Varia with it) is quite faint. Use the included handlebar mount and I can't hear it at all. However, use it with a 3rd party mount that is metal and open in the back and I can hear the beep every time. Another minor problem is how long it takes for the incline percent to measure correctly. Not that important but it should respond better. Overall, despite that, very happy with it. Also, there are many display options to make it better set up for you. Moving up from my Garmin 500 to the Garmin 820 is night and day, I only have more pros than cons since I only had it only 2 months in use, but its definitely technology in the right direction. Display is nice, but I wish it was the size of the 800. I had a 510 that worked fine but I wanted to upgrade. The upgrades were the color touch screen, improved maps, and a few minor software things. The display is good, but essentially the same size as what I had. IMHO the 1000 is too big and the 510 is too small. 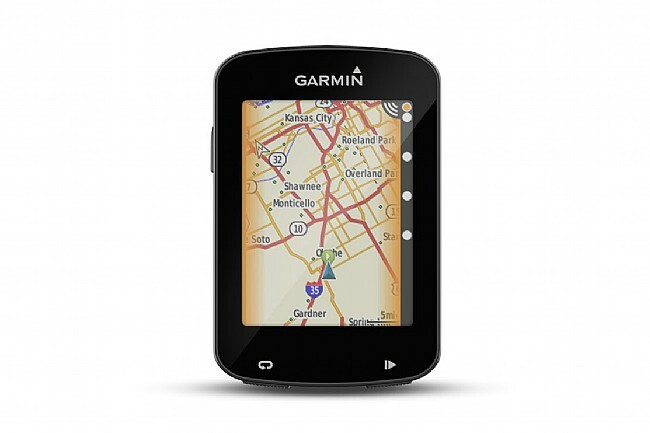 The 800 seemed to be Goldilocks, but for some reason Garmin didn't stick with it. I purchased the 820 to replace my 800 with map card. It is a little smaller and I like the new features like how it links to my iPhone. It came with an out front mount which was a nice touch. I like lots of data as I helps me focus on something other than how tired I am. Updated with crisper controls and more features. I previously owned a Garmin Edge 1000. I use the computer for training rides and racing - occasionally venturing out on long exploring rides. The map on the 820, although smaller, works just as well as the 1000 ever did. Sharp resolution. And the control buttons on the 820 are much more crisp and positive. I also prefer the smaller size. I also have an old Edge 500 (bombproof!) and an Edge 1000. The new 820 has a longer battery life than the 1000. The navigation is of course not quite as visible, given the 820's smaller screen size, however, it still navigates well...even on dirt trails. They have improved the software, with the latest update allowing 3 different 'sensitivity' settings for the touch screen. Upgraded from the Garmin 810 and I really leak the small unit. It fits much better onto my stem which I like better than the out front mounts. Touch screen is easy to use and once you've had Garmin units for a number of years, their functionality is simple to learn and use. Great product and a good price on Bike Tires Direct. The elevation function using the satellites seems to have a lag in measuring your data compared to the Garmin 810. My wife's 520 usually has 600 additional feet of climbing on an average 3000 ft. day. Traded up, finally, after years with the 500. Works well but with two minor quibbles. First, the screen is more difficult to see in bright light. And secondly, when wiping sweat droplets off the screen, I sometimes inadvertently change pages, which can then be difficult to swipe, especially on the fly. That alone makes me almost prefer buttons instead. A little pricey compared to competitors, but okay if you catch a sale. Returned the Edge 520 go the Edge 820, both worked fine, however I wanted the touchscreen. This was an upgrade from the Edge 500. Saving your data when paired to your cell phone is fast, getting you kudos from friends on Strava. Im still figuring out all of the features it did cause an alert to my emergency contact when I stopped for an adjustment. Great product features. 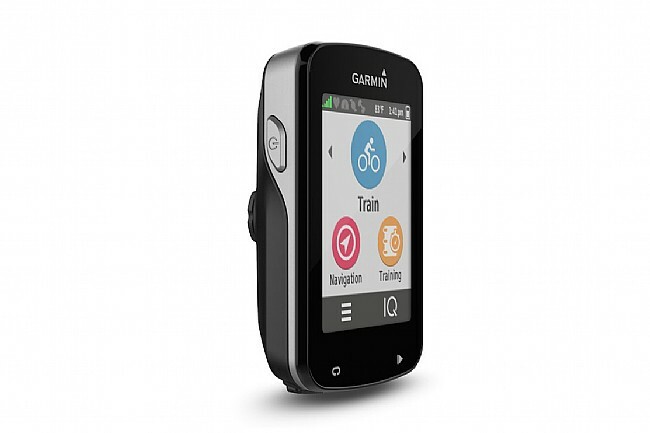 Good size, combines touchscreen functionality of garmin 1000 with the size of the 520. Rides upload immediately to StravaGarmin Connect via your phone or WiFi, you can see incoming texts and calls. Touchscreen though was abit of a setback. Abit difficult to use especially when riding. Does not perform like the smartphone screens to which so many of us have become accustomed. But overall, Im very pleased with the product, still a recommended buy. All computers seem overpriced since upgrades are needed more often than I would like. Watch for sales. Others have complained about the sensitivity of the touch screen but it seems just right to me including when using gloves. The stop and onoff buttons are located on the bottomside to prevent accidental touches. Garmin seems to continue to lead all others in the field. Great unit. Customizing data screens is easy and can be changed mid-ride. Havent had to use navagation, but tested it out on local route and was very easy to use. Touch screen works good and I added screen protector and still works good. Nice upgrade over my Edge 500. Used on multiple bikes. No more searching for sensors after initial set up. Looking forward to the faster processor for maps and turns. The 500 was so slow. I use the item on the road and CX. I like the small form factor and the placement of the startstop and lap buttons. I previously had an Edge 510 so I was familiar with the touchscreen. The Edge 820 touchscreen is not as precise as I would like it but it's doable. The performance metrics are a nice feature. It pairs easy with all of my devices. So far it's been working well given the discounted price I paid. I bought this to replace my 510 since I like the touch screen. It's faster starting up with more features and a larger screen. The color navigation is nice. The battery life is poor, less than my 510. I can get 2-3 rides out of a full charge. The altimeter failed at 6 weeks and Garmin had to send me a new one. I miss the bike profiles from my 510 but the 820 had no problem handling all the sensors from 5 different bikes. Overall it's a big step up from my 510 but I think battery life could be better.